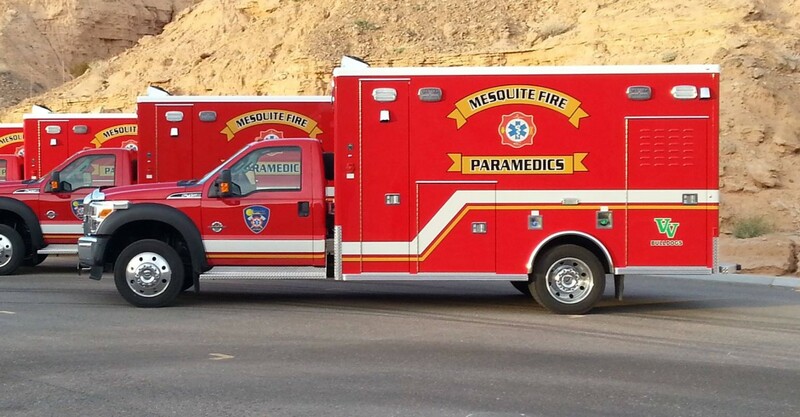 MESQUITE, Nev. – Where they once were limited in the number of medications and devices they could offer as regular paramedics, a handful of firefighters with Mesquite Fire and Rescue have expanded their abilities by becoming certified critical care transport paramedics. These specially-trained paramedics now have access to additional and much needed lifesaving medications and equipment at the scene of a medical incident or accident, or for use while transporting a person to the hospital. “It adds more medication (and) adds another level of care to those who need it in the city, and that goes for our residents and the million visitors we have annually,” Mesquite Fire Chief Kash Christopher said. Two firefighters received their certifications to be critical care transport, or CCT, paramedics in July, with a third recently passing the test. A fourth firefighter will take the test later this week. Mesquite Fire and Rescue was looking at adding the critical care transport program to its roster of capabilities for a while, Christopher said, but it wasn’t until he became fire chief in 2014 that it got underway. Before coming to Mesquite, Christopher’s “last gig” was a war zone in Afghanistan, he said. Once at the helm of the department, Christopher assessed the fire department’s current capabilities and how it could improve to better serve and benefit the community. “The main reason I’m doing this (implementing the critical care transport program) is to make sure people have the extra care available to them in case something happens,” he said. 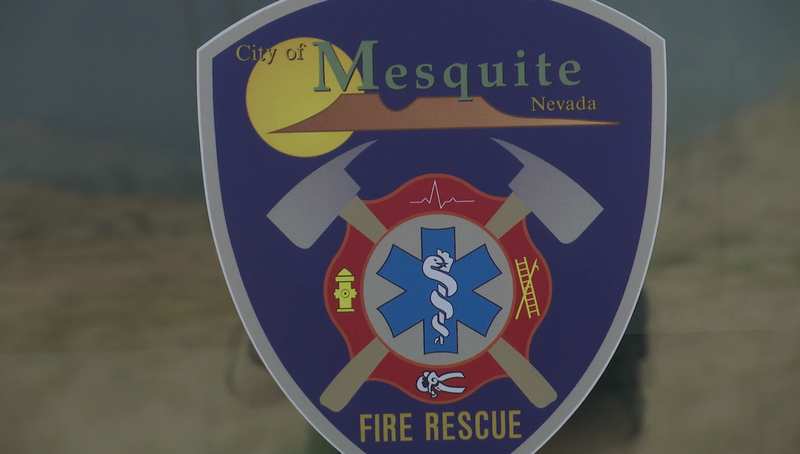 A big factor that played into Mesquite Fire and Rescue’s implementation of the program was the fact that Mesquite’s population has a median age of 53. Being in a largely rural area was also a factor as resources can be limited and paramedics sometimes have to make decisions for patients on the fly, Christopher said. “There are always limited resources, so it’s nice to get this program off the ground,” said CCT paramedic and firefighter Jayson Andrus. Regular paramedics can administer 33 specific medications, while CCT paramedics can use up to 12 more. 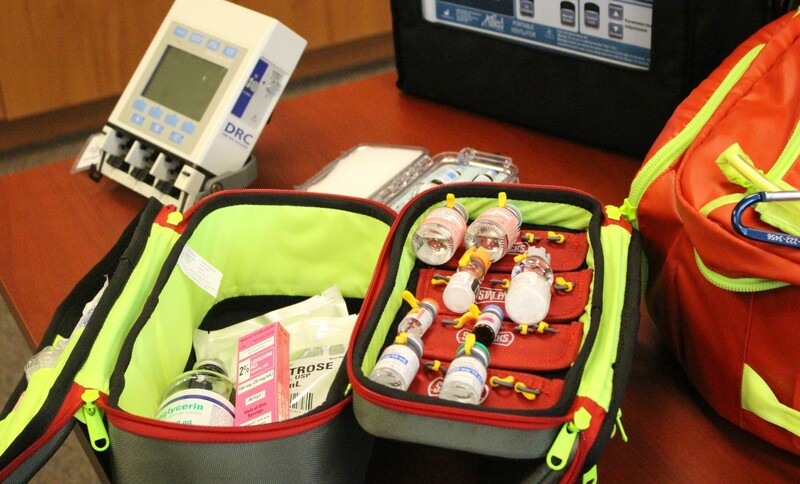 While on ambulance transports, they can also carry an additional 30 medications outside of the hospital, as well as employ certain equipment and techniques during 911 calls that they were unable to before. Some of the medications they are allowed to give patients include succinylcholine, Cardizem, IV nitroglycerin and Solu-Medrol, among others. They are also carry surgical cricothyrotomy kits (used to create an airway when other methods are contraindicated) and transport ventilators. Andrus and firefighter Karen Hughes have been certified as CCT paramedics since July and have already been able to put their expanded skills to use. In one incident, a tourist at an area casino had a rapid heartbeat that his pacemaker could not bring down, Andrus said, even after shocking his heart nine times. “We arrived on the scene and used a drug, Cardizem, that slowed his beat to 80 beats a minute, which in turn stopped the internal pacemaker from shocking him,” Andrus said. In a similar incident that occurred Friday, Hughes said, a man who had gone to a clinic for dizziness was reported to have a heart rate of 200-210. Mesquite Fire and Rescue arrived at the scene and was able to give the patient the Cardizem medication while taking him to Mesa View Regional Hospital in Mesquite. Training and studying for the critical care transport certification test included attending a 116-hour training program in Las Vegas taught by nurses and physicians with subjects in advanced pharmacology, advanced physiology, advanced airway management and cadaver labs. This was followed by a 120-hour field internship running critical care transports under the guidance and direction of an experienced CCT paramedic or nurse in the Las Vegas emergency medical services system. The certification is considered one of the hardest EMS tests there is and has a high rate of failure in the first attempt, Christopher said. However, Hughes and Andrus were already familiar with some of the medications and other aspects of the test and training from previous experience. Andrus has been a paramedic with Intermountain Life Flight out of Dixie Regional Medical Center in St. George, Utah, for the last six years. Hughes also has previous experience as a paramedic with Mercy Air, an air medical transport provider, as well as emergency room experience out of Nellis Air Force Base in Nevada. Prior to getting the certification, Hughes said it was frustrating to have knowledge and experience in how to use certain medication, yet not have the ability to use or have access to them. 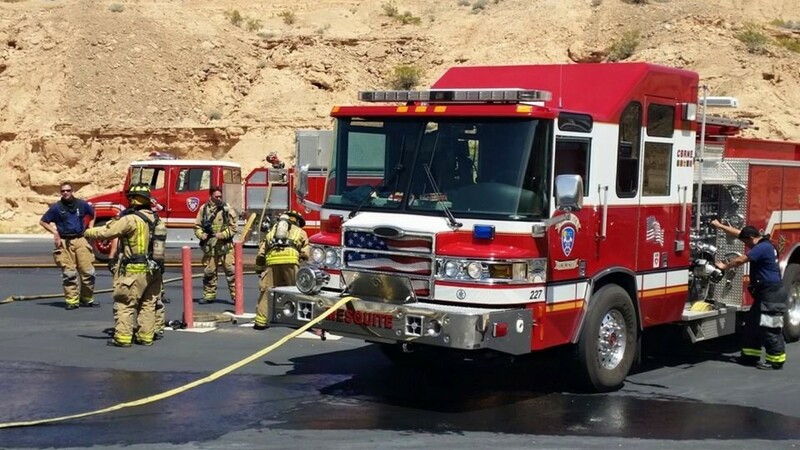 Though Mesquite Fire and Rescue primarily serves the Mesquite area, it also aids nearby fire departments in Bunkerville as well as neighboring towns in Arizona, including Scenic, Beaver Dam and Littlefield. See video top of this story. This is fantastic news for the community ! way two go firefighters ! Hip Hip Hooray ! Hip Hip Hooray ! job well done, your community appreciates the things you all do. God bless each and every one of you !